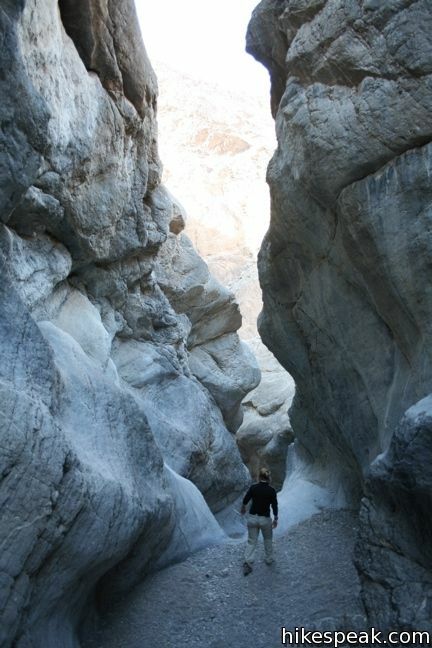 More than a hike, Grotto Canyon in an adventure. The unmarked road leading up the canyon does not show up on park maps, and the canyon itself has an undeveloped feeling of discovery. 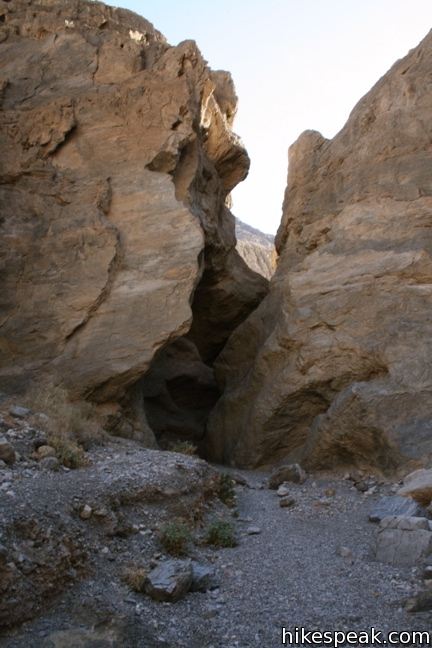 Rock obstacles in narrow sections of the canyon require some technical climbing, so this is not a stroll for beginners (nearby Mosaic Canyon is more appropriate for those hikers). 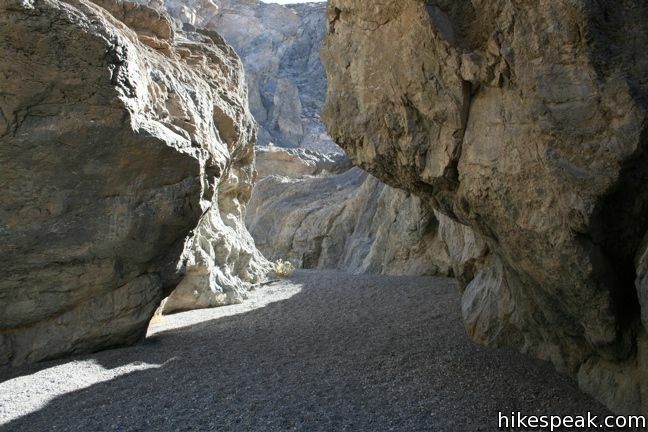 The gravel road leading up to the mouth of Grotto Canyon becomes too rough for low clearance vehicles a mile from the trailhead, requiring those without a 4X4 to cover that stretch on foot. This extra distance is slow going thanks to the loose gravel in the wash. 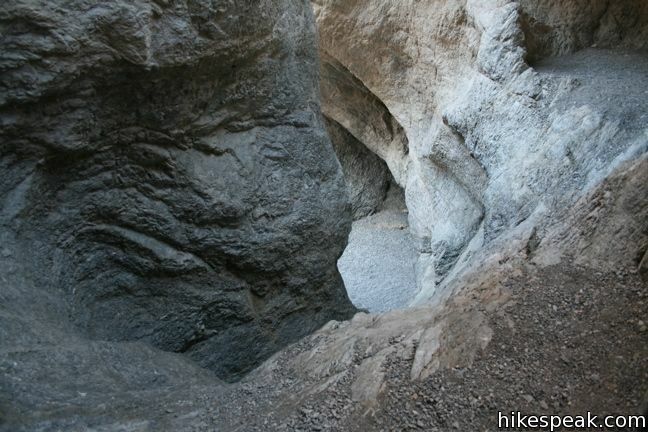 Almost immediately, the trail enters the first narrow grotto housing two obstacles that must be climbed to proceed. 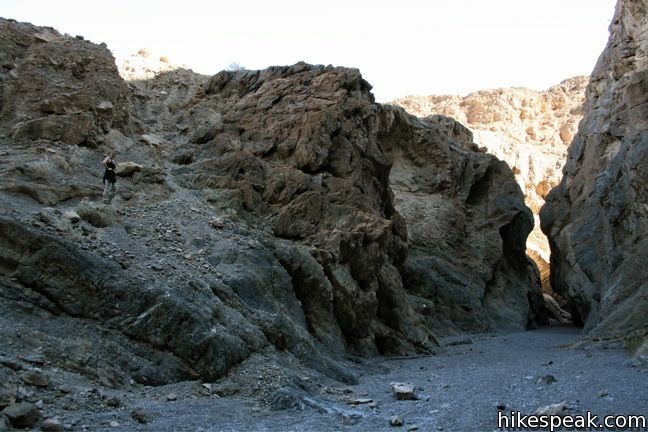 These are the most difficult obstacles on the hike. 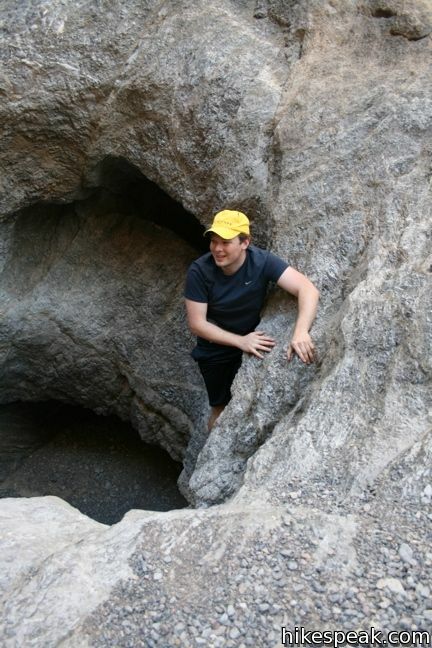 If you can make it past them, you will not have trouble with the rest of the canyon. 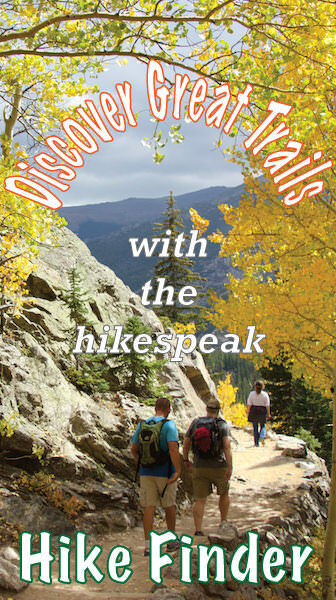 At the first obstacle, climb up the steep twelve-foot polished stone pour-over that stands in your way. 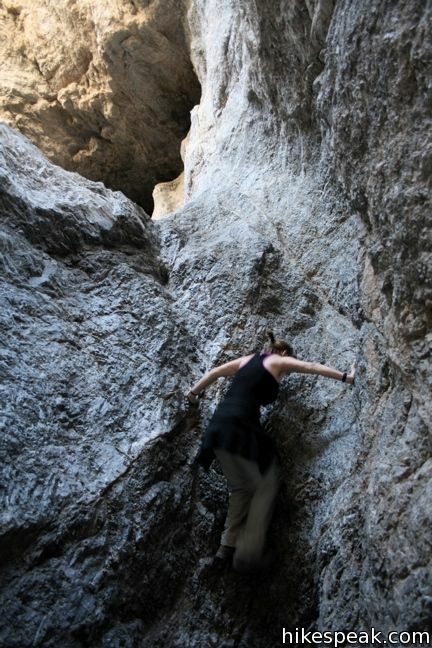 Push off the rock walls to gain enough leverage to push your way to the top. Just a couple hundred feet up the canyon, comes a second obstacle. For those under six feet tall, stepping stones may be used to get a leg up on the ledge beneath the lip of the overhang. These stones should already be in place. Lift yourself up on the ledge (which would be a lot easier to get to if it were a foot shorter), and ease your way to the right out of the grotto. 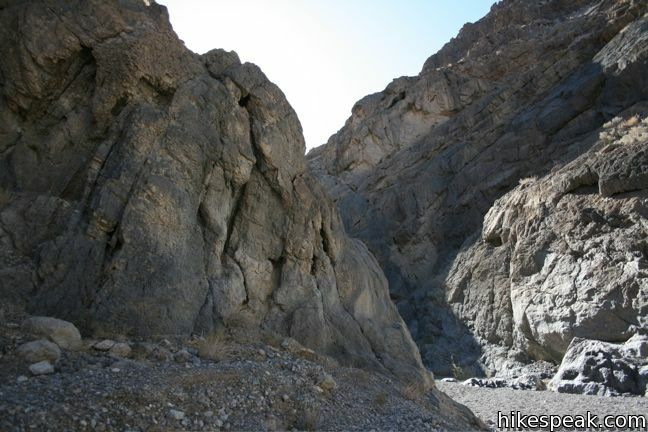 The canyon widens briefly as the trail continue uphill over loose gravel. 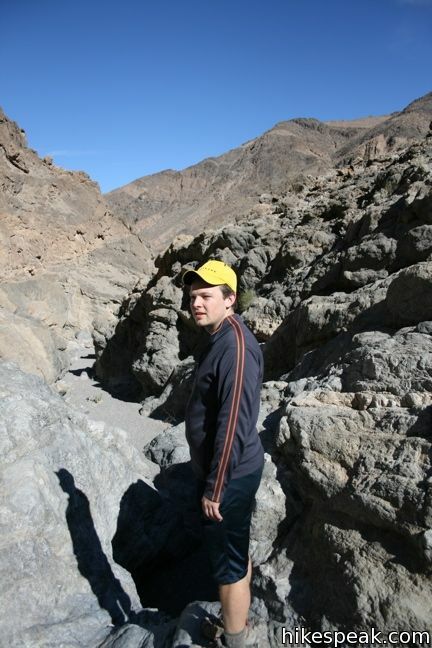 Quickly, the canyon narrows, and steep walls return. 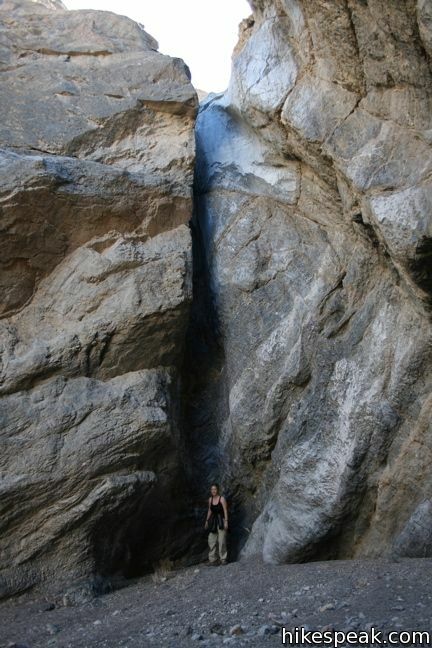 A series of easy-to-climb pour-overs lead up to a narrow chute. This 8-foot chimney is a bit tricky to climb. Despite not being very tall, the tightness of the chute makes it awkward to maneuver up. 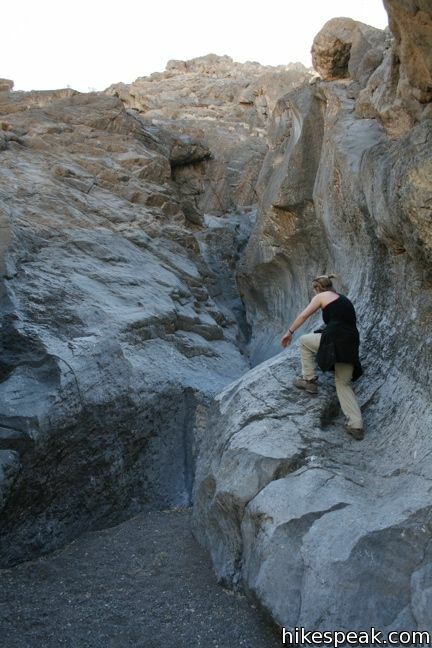 Once above the chute, press on to the next grotto, where a forty-foot dry falls stands in your path. 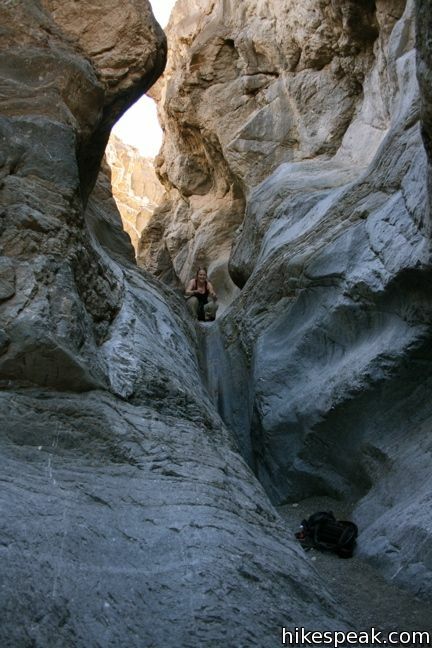 Without climbing equipment, there is no choice but to come back down the canyon. 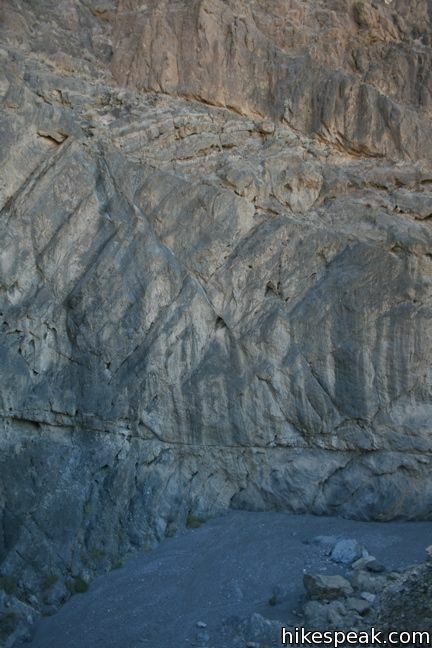 Outside of the grotto, a footpath leads up the slope on the right side of the canyon (as you are facing downhill). 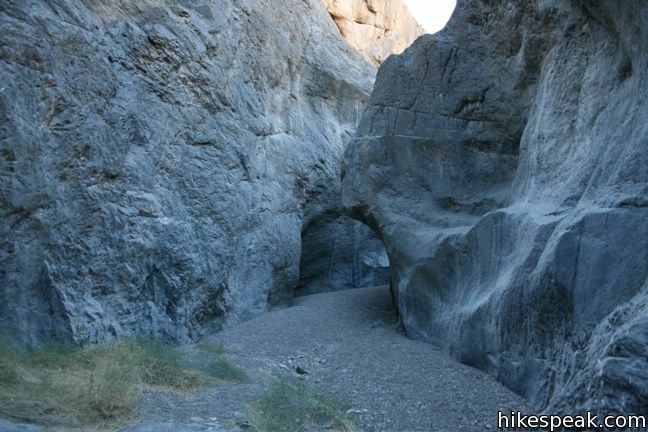 Follow this path as it climbs above the dry falls and reenters the canyon. Watch your step. This is not a place you want to slip. The trail continues up the canyon past a few easy pour-overs. 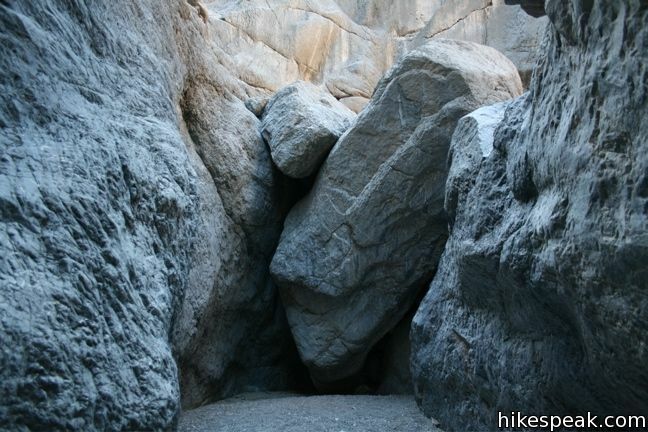 The canyon narrows again at another grotto where a large choke stone blocks the canyon. 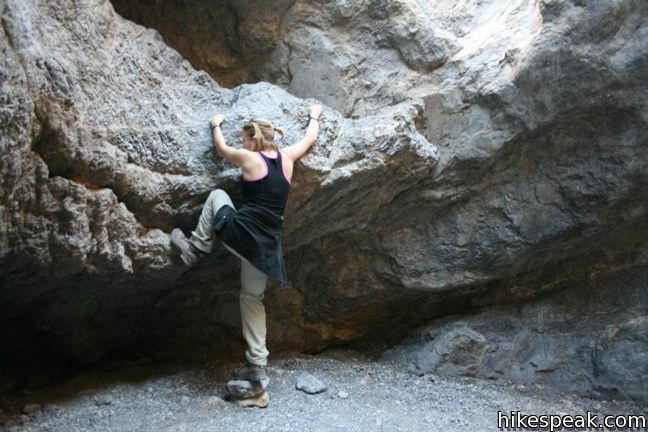 This fifteen foot rock cannot easily be climbed. An overpass trail is reported to allow hikers beyond this obstacle, but its location is not obvious. Either way, this seemed like a good place to turn around. Venturing down the obstacles in the other direction is just as fun. 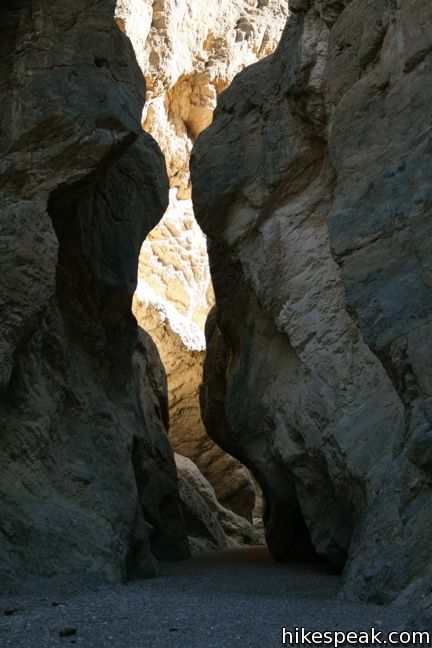 This Grotto Canyon excursion is 2 to 4 miles round trip, depending on where you park your vehicle. 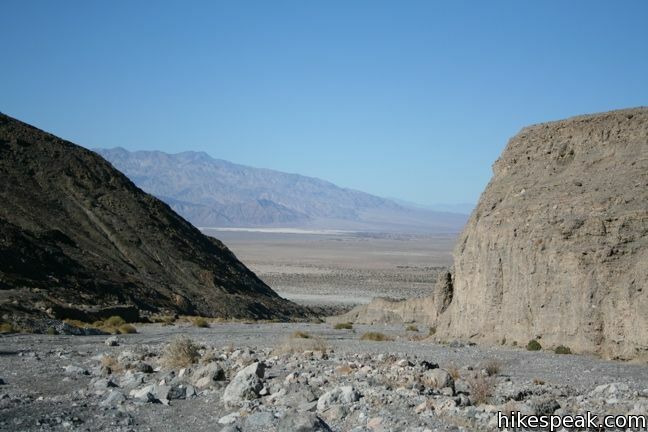 To get to the trailhead: From Furnace Creek drive 22.5 miles northwest on Highway 190. Just before the parking lot for the Mesquite Flat Sand Dunes and 2.5 miles before Stovepipe Wells, turn left onto a narrow unmarked gravel road. 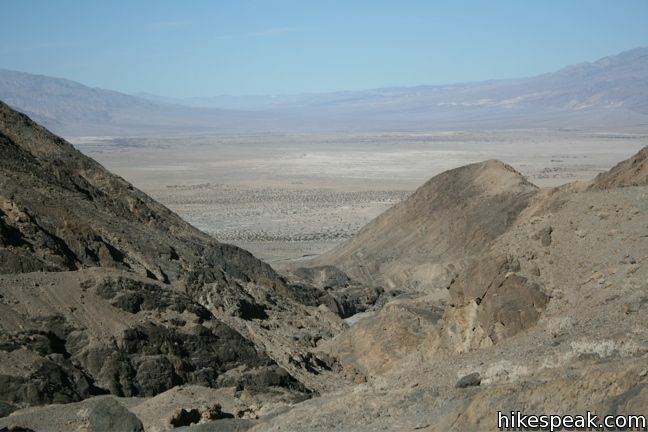 One mile up is a severe drop into a wash which would be damaging to vehicles with low clearance. Stop here if you are driving one of these. Otherwise, drive up the canyon to the end of the road. 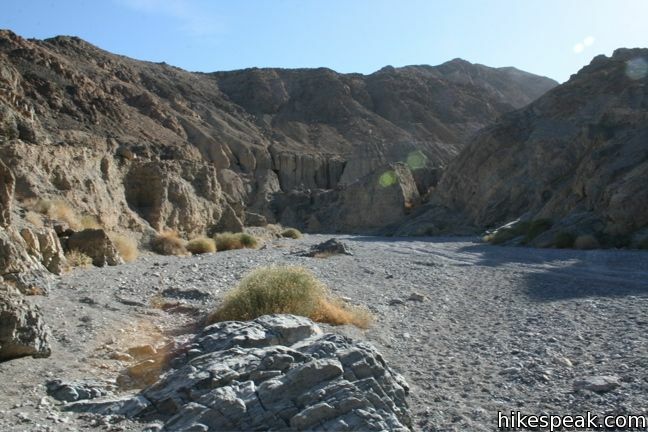 This 1 to 4-mile hike starts up a smooth marble slot canyon and exposes visitors to plenty of great Death Valley geology. 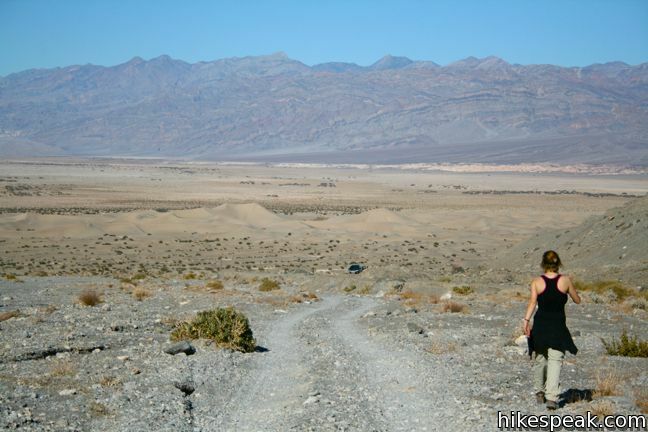 This 1 + mile hike explores the most visible (but not the largest) sand dunes in Death Valley. 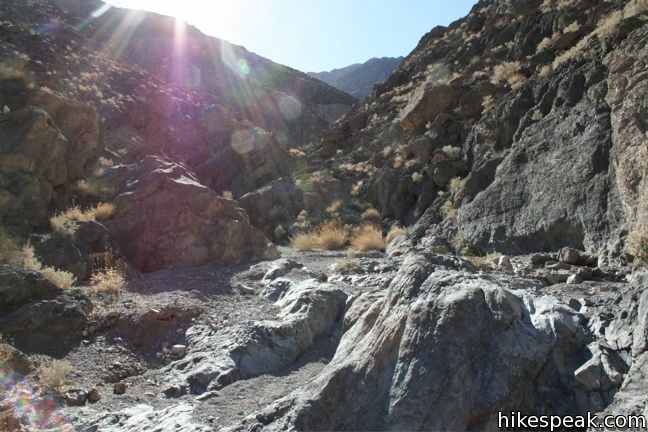 This 2-mile hike visits a refreshing year-round waterfall on the western edge of Death Valley. 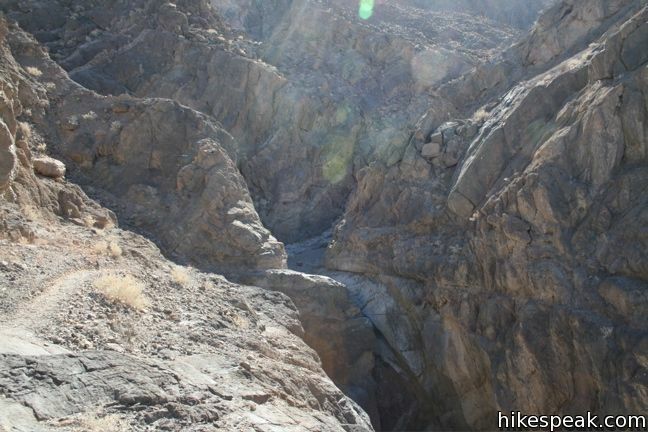 This 4 to 7-mile hike visits narrow slot canyons full of pour-overs, carve outs, and dark passages that beg to be explored. is that granite you guys are climbing up and is it solid? ?